Impingement syndrome occurs when there is inflammation of the rotator cuff tendons and the bursa that surrounds these tendons. There is a difference between tendonitis and bursitis, but in most cases of impingement syndrome there is a combination of these problems. Impingement syndrome occurs when there is inflammation between the top of the humerus (arm bone) and the acromion (tip of the shoulder blade). 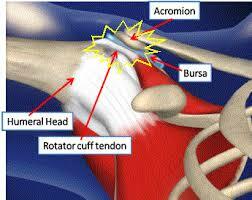 Between these bones are the tendons of the rotator cuff, and the bursa that protects these tendons. Normally, these tendons slide effortlessly within this space–called the subacromial space. In some people this space becomes too narrow for normal tendon motion, and the tendons and bursa become inflamed. Inflammation leads to thickening of the tendons and bursa, and contributes to the lack of adequate room in the subacromial space. Eventually, this space becomes too narrow to accommodate the tendons and the bursa, and every time these structures move between the bones they are pinched–this is why the condition is called impingement syndrome.